Hundreds of protesters have arrived in Bolivia's main city, La Paz, to demand the government resume the construction of a controversial road through an Amazon reserve. President Evo Morales cancelled the project last year after a similar protest march by indigenous tribes. They said the road would destroy their rainforest homeland. But other communities say the highway would bring much-needed economic development to the Bolivian Amazon. The protesters in favour of the road through the Isiboro-Secure reserve - known as Tipnis - marched for more than 40 days from their home communities to demand the government change its position. 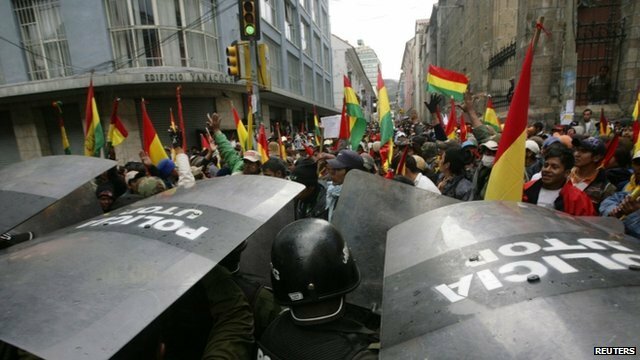 Clashes broke out as they tried to force their way through riot police blocking the approaches to La Paz's main square, where the presidential palace is located. "The road means development for San Ignacio de Moxos, where we live in isolation, and development for Bolivia," protester David Ibanez told the AFP news agency. Opposition groups say the march in favour of the road was instigated by supporters of President Morales. Some of those marching are coca-growers from the Chapare region around Villa Tunari, where Mr Morales began his political career as a union leader. They have been accused of backing the road project in the hope of occupying new lands in the Tipnis reserve to grow coca - the raw material for cocaine. President Morales cancelled the highway last October in the face of a march by indigenous communities from Tipnis that gained widespread support nationwide. He had previously insisted that it was vital for national development, but backed down as the protest gathered strength. The road project was being funded by Brazil to link the Brazilian Amazon to ports on the Pacific coast of Peru and Chile.